The China Chongming team is racing on its continent in the Ladies Tour of Qatar, but is 4000 miles away from home and several levels below the competition like English race leader Lizzie Armitstead. Armitstead rode at the front of the stage on Wednesday to win the stage and take the gold leader’s jersey. 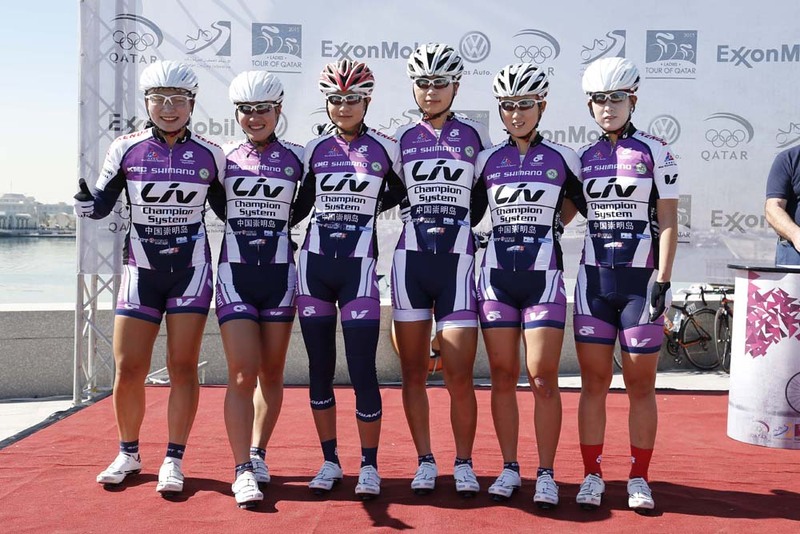 Scattered in different groups behind, sometimes solo, the Chinese cyclists in their white and purple Chongming-Liv-Champion System kits fought for survival. Xiu Jie Jiang has the most experience of the six having raced in Qatar before. The other five are covering new ground in the Middle East. Bai explained that the 2.1-ranked Tour of Qatar marks her debut in a professional race. Even with the differences, they have adapted well, attacked and rode in escapes when they could. Bai sits 35th overall, nearly five minutes ahead of Great Britain’s Lucy Garner. Team-mate Ya Nan Liu, however, holds the last spot, 85th overall. “It’s Asia, but it’s very different from home with its language and culture,” sports director, Wei Shen explained. “The level in Qatar is higher with the Europeans and Americans. The we face high winds and tough competition. We come here to get better and better. In China, the highest ranked races they participate in are the Tour of Chongming Island and the Chongming Island World Cup. They regularly take part in the national cups and national championships, and visit the Asian Championships. The Asian Champions are going on now in Thailand, where some the team’s more experienced girls are racing on the track. When the Tour of Qatar finishes, three of them from the team will travel to the championships for the road race. The team likely will not travel to Europe, but will visit the US this year for the Philadelphia World Cup and maybe the Tour of California. Today they will finish the four-day Tour of Qatar, but some, like Bai from China’s northwest Shaanxi province, do not want to leave Doha.